Wind farm production could be placing Scotland's white-tailed eagle population under threat, a wildlife charity has warned. RSPB Scotland said the discovery of four dead white-tailed eagles near a wind farm area off the Norwegian coast gave cause for concern. 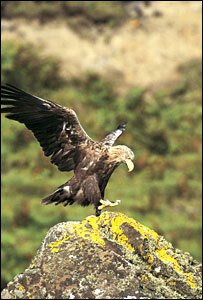 It fears that the eagles may have been killed in turbine collisions. The green energy industry said it strived to ensure that wind farms did not interfere with wild birds. The species is found in significant numbers on Smøla, the site of a 68-turbine wind farm. About 30 other white-tailed eagles failed to return to nesting sites within the wind farm area, increasing RSPB Scotland's fears that wind farms in the UK could take a similar toll on native and migrating wild birds. The four dead birds were found between August and December last year on Smøla, a set of islands about six miles off the north-west Norwegian coast. Two had been sliced in half, apparently by a turbine blade. White-tailed eagles are beginning to thrive in the Western Isles of Scotland as a result of a 30-year reintroduction project, RSPB Scotland said. Spokesman Mark Avery said: "These findings are shocking yet may only be the tip of the iceberg. "Research on Smøla is being stepped up and if more dead birds are found, and even fewer are able to breed, we will be doubly determined to fight wind farm plans that could cause similar destruction in the UK." Fellow director Stuart Housden added: "We are campaigning hard against the proposed 234-turbine wind farm for the north Lewis peatlands partly because of the great danger it poses to Scotland's eagles. "This environmentally sensitive site is protected under European law and a large wind farm there could have catastrophic implications for a wide variety of bird species - including both species of our native eagles - and the fragile peatland environment as a whole." Scottish Renewables, which represents the green energy industry, said it worked closely with conservation groups to ensure wind farms did not interfere with wild birds. The developers of the Lewis wind farm, Lewis Wind Power, said revised plans limited the effect on local wildlife. Speaking last November, Lewis Wind Power director David Hodkinson said concessions included recreating peat habitats elsewhere during construction of the wind farm, phasing construction activity to avoid the bird breeding season and taking bird flight paths into consideration in the layout of the farm.